Social and casual game developer PurpleKiwii has a lofty goal with its match-three Facebook game Monster Busters: to be the most advanced match-three puzzle game available. Its players apparently appreciate the effort, as the game has reached over 1.4 million monthly active players and climbing, according to our app tracking service AppData. 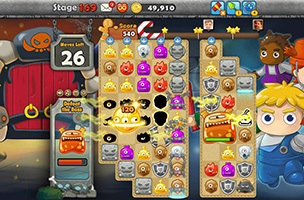 Monster Busters challenges players to complete match-three stages to rescue Gingerbread characters that have been trapped in a tower by evil monsters. Players make matches with colorful monsters, climbing the tower as they complete each floor’s levels. Each level in Monster Busters has a different layout and overall goal, from earning points in bulk to defeating specific kinds of monsters. Some focus on the gingerbread villagers themselves, challenging players to make matches on top of icy squares to free them. Making matches of four or more monsters creates bombs that clear whole rows or columns from the board, while a match of five monsters creates a hammer that removes all monsters of a single color. Each stage comes with a leaderboard for comparing scores against friends, and gamers can replay stages to earn up to three stars on each. Eventually, players unlock extra power-ups to help them complete tricky stages, like bombs and extra moves. In addition, boss battle levels offer extra challenge to players, asking them to defeat boss characters on the game board by making matches with the monsters touching them. Monster Busters is available to play for free on Facebook. You can follow the game’s continued progress on AppData, our tracking service for mobile and social apps and developers.